As a wedding photographer, I love hearing about all the firsts. How you first met. When you first fell in love. How he proposed. I feel blessed to be able to document love. The pure, genuine, starry eyed kind. 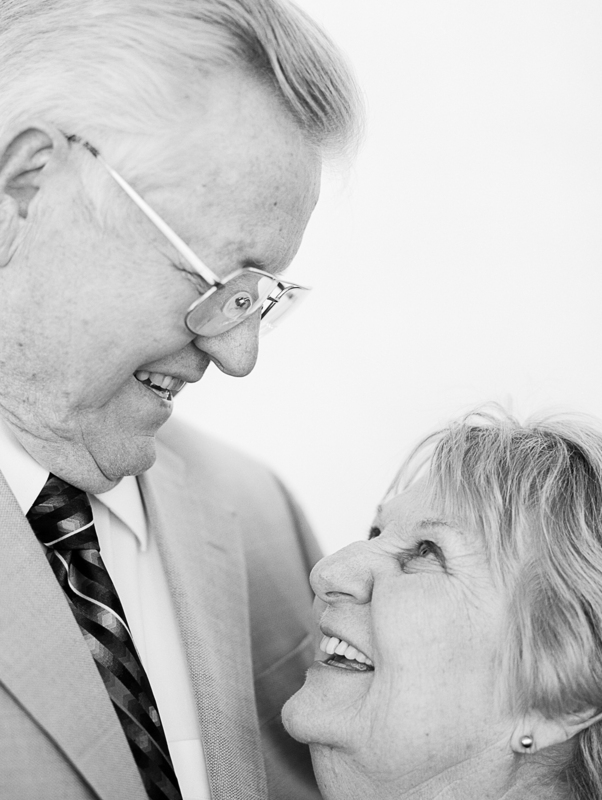 I’m excited to share with you a photo series called, “To Grow Old With You”, that grows sweeter with age. The fifteen couples that participated were strangers to me when I interviewed them. Each shared their love story with me and a few pearls of wisdom. We laughed together, sometimes cried together, and became dear friends. Cheers to the month of love. The story of how we met needs a little preface. Both of our grandparents were candy distributors in Provo, and our parents both catered. Following in their footsteps, we now own a catering business. Steve: Though I was not acquainted with Cheryl, I grew up singing with her older brother and sister at Brigham Young High School in Provo. After high school, we both moved from Provo to different areas of California. As fate would have it, We ended up at the same dance in California. I brought a date, whom I took home early after seeing Cheryl there. I came back to the dance and asked her brother who the girl with him was. After the dance was over, I shouted across the parking lot, “You don’t need to worry about your kid sister. I will take her home!” That only worked because of my years of history with her brother. He has a twin brother and I have a twin brother, and we rode the school bus together. I was in the third grade and he was in the sixth grade. We fell in love riding on the school bus and going to baseball games together. I was eighteen and she was sixteen when we got married. We met on a blind date. My niece set us up and we went to Chuck-a-rama. She didn’t like me at all and I didn’t like her dog. Jan: We met in 8th grade. I asked him out to a Sadie Hawkins dance in the ninth grade. He said he would have to get back to me! Richard: I really just meant I was too young to drive, and I had to ask my dad if he could drive us. Jan: I took that to mean he was waiting for a better offer. 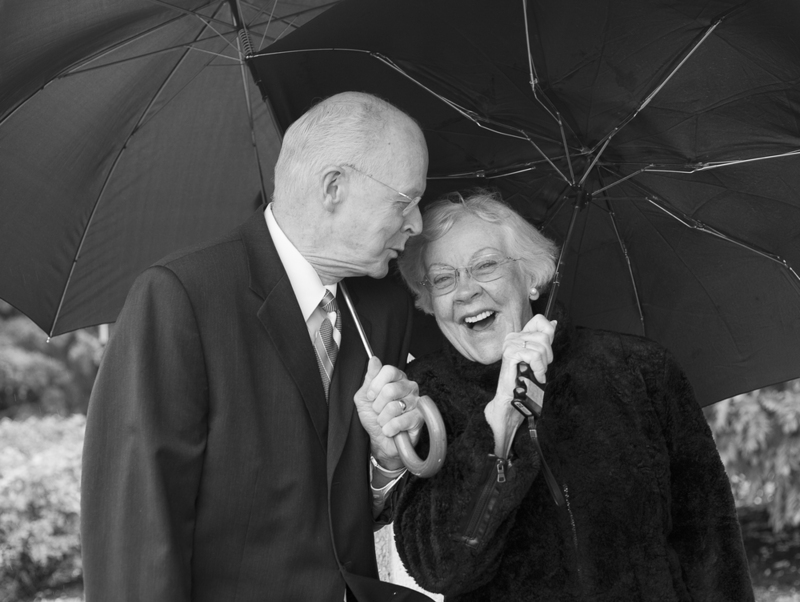 We met when I was working at a women’s dress shop in California, and he was working next door at a men’s clothing store. Every morning we’d both go out to sweep the sidewalk. One day our brooms met, and we fell in love on that sidewalk in front of those stores. We talked everyday and he swept me off my feet! I was just hired as an Administrator at a nursing home. There was quite a bit of junk in the back and I needed to burn down some of the weeds. I called the fire department for a burn permit, and Alan showed up. I had my horse trailer in the back and he has horses. So we started visiting and we could tell we had similar interests. He asked me out and my first reaction was, “Oh no. I’m not having anything to do with this.” Thank heavens the Lord is smarter than I am, because Heavenly Father told me this is what I was supposed to be doing. He came back a week later and asked if we could have dinner. I was resisted at first, but I said yes. It was the best move I ever made. Alan knew right away. I was resistant, but he knew. This was our second marriage. I could just imagine the Lord saying, “Let me help you with this one dear.” You need to have eternal fortitude to stay there. It is important to be humble and unselfish. The biggest problem is when you think of yourself first. It’s so easy to do. the natural man. Try and be empathetic to how they see things. We met in the Library. Well, that was our second meeting. We actually met at church. He introduced himself and then later that night called me at home. He asked me if I would go out with him and I told him I had plans. He asked me about the next week and the next week, and I honestly had a date every week. So he never called after that. That brings us to the next quarter. I was studying in the library. I saw him looking over at me and he came over and introduced himself. I remembered him, but he had forgotten me! That is where it all began. He walked me back to heritage halls and we talked and talked, and became acquainted. One way we stay unified is just by getting old. We have never been old before, and we are just trying to learn how to be old together. We rely on one another for health issues that come up. Someone said I’m over the hill. That’s funny, I don’t ever remember being on top! Diane is a wonderful, wonderful wife. George: Diane, would it be all right to tell her that you were Miss Oregon? We met in an economics class. I was just studying the young lady in the class.